I was raised as a preacher’s daughter with church as the center of our family. I am blessed to now serve and lead along side my own family at Henryville United Methodist Church. I graduated from Birmingham-Southern College in 2002 with a Bachelor of Arts in Religion and a distinction in Leadership Studies. I then worked at Camp Sumatanga where I met my husband Neale. We have been married for twelve years. We have two children: Noah (11) and Hannah Kate (7). I began serving my first churches while in seminary at Emory University in 2003. We have since served in Birmingham and in Florence. We moved to Guntersville in 2014. I greatly enjoy doing ministry together with our church family. At Henryville, families and people of all ages gather from our community to worship, study, and serve together. We hope you will join us as we gather, claiming Christ's church as your family also! Wesley is our Music Director. Whether you prefer gospel, choruses, hymns, or sung liturgy, Wesley is always working to incorporate every way of helping us worship God in song. Children, youth, and adults interested in music can each find a way to participate in the music ministry at Henryville UMC. Tammy is an amazing children's director! She loves the children of this community and they love her. Every week is filled with Bible lessons that come to life for children of every age. Tammy also plans mission trips, seasonal events, and Vacation Bible School. Music has been a part of my life and faith from an early age. I sang my first solo in church at the age of five and began taking private, classical piano at age seven. After eight years of piano, at sixteen, I began playing piano in church and have been playing ever since. During that time I took two years of voice and piano at Snead State College. I formed my first band at thirteen and began playing professionally in 1973. Since that time I have done a lot of things to make a living but playing and singing in church is my calling. I have lived that calling by playing in Baptist, Methodist, Presbyterian, and Unity churches. 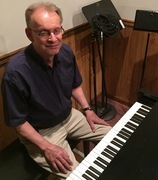 I currently play for worship at Barfield Nursing Home and Henryville United Methodist Church. This allows me to use the talent God gave me. Everybody has a talent from God...I hope you will use yours as well! If you are looking for me, you will likely find me at one church or another... I am blessed to have not only a worship church, but also a work church. I have been a part of Henryville United Methodist Church as the Church Administrator since 1993. After over 20 years of building relationships with the children and adults of HUMC, I consider this my church and my church family! My own family includes my husband Leamon, of 40 years, our lovely daughter, wonderful son-in-law, and three delightful grandchildren. I am very blessed to have my family, my worship church family, and my work church family! I hope you will come visit us in person and get to know the family.